To those of us who identify as anarchists, brotherhood/sisterhood among activists who struggle for a radical transformation of society towards freedom and equality must be a cardinal principle in theory and practice. Likewise, for anarchists the links between States can only create suspicion, since we’re talking about links between structures of oppression, inequality and injustice which anarchism has always denounced and fought against, as we have also fought against capitalism. Therefore, the general political line of anarchists has been –with a few polemical exceptions that confirm the rule – to promote and practice international solidarity among the exploited and oppressed, which demands the repudiation and opposition to those instruments of oppression and exploitation that are the States, both against their repressive expression domestically in each country as well as against their association, as this usually yields unfavorable results for the populations under their control. But, what happens when the States that enter into a relationship are progressive, revolutionary or proclaim themselves as such? This would be the situation in the case of Cuba’s and Venezuela’s governments’ tight connection. This begs the question: does this suspend or cancel the classical anarchist position of struggling against the State or against alliances among States? There will be some who will say yes, out of ignorance or wanting to falsify anarchism. They’ll say that those socialist States constitute an advance on the road to the social revolution we desire, therefore even though we might have criticisms or objections, these will always be minor compared to the goals achieved or possible under these governments. They will bring up the bogeyman of how terrible the failure of such States would be, how political control would fall in the hands of the most evil pro-imperialist neoliberal right wing, a nightmare that must be avoided even at the expense of accepting authoritarianism, repression, corruption, technical and administrative inefficiency and all those evils that seem to flourish as the socialist State gathers strength and longevity as has been obvious in all Marxist-Leninist regimes that have ever existed. Our concrete experience – 51 years for Cuba, 11 for Venezuela – of what these so-called socialist States have been and still are certifies that the anarchist position of repudiation of any form of institutionalized state control can not allow for the “progressive” or “lesser evil” character of the governments that rule our countries. Whoever wants fail-proof evidence, in the case of Venezuela, of the falsehood of such pretensions can read what we have been publishing since 1999 in El Libertario (our web site is written in Spanish and we also have sections in English, French, German, Italian and Portuguese). A similar corroboration in the case of Cuba can be found in the six web pages at the end of this article where you can read the thoughts of Cubans in the island and in exile. In both cases the red herring of anti-imperialism that both regimes boast of is dismantled. The opportunist anti-Yankee screaming hides many shameful agreements and compromises with big transnational capital, disguised as modest mixed enterprises in both countries. Although either government’s propaganda attempts to convince the gullible that there is interchange and cooperation between partners with equivalent resources, with Cuba contributing knowledge and human resources in exchange for a similar value in oil and other Venezuelan products, suffice it to look objectively at where Cuban professionals and technical experts work to see that their knowledge and competency contribute very little to what was there previously, and that they are usually there because the Chavez regime is politically suspicious of the majority of the local equivalents, who also demand salaries and working conditions that are out of limits for these Cubans. 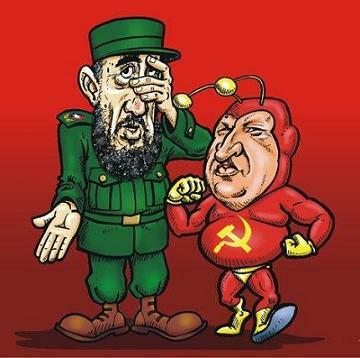 In any case, the worst result of this relationship for the Cuban people is that this has provided an oxygen tank to a regime that was drowning, one that went from being a guest at the Soviet table to being a ward of the “Bolivarian” sanctuary. The transition from one situation to the other doesn’t mean that the State has ceased to be a dead weight on the long suffering backs of the everyday Cuban. - But, isn’t Chavez different? On the Venezuelan people’s side, they try to sell the canard that thanks to Chavez’s regime and the Cuban government’s collaboration, their access to health and education, besides other things like sports and culture has improved. The truth is that here, the available figures (see PROVEA yearly reports in www.derechos.org.ve) as well as the multiple testimonies heard daily show that the situation is quite different than the official myth, and if it ever appeared to approach the truth, as for instance the initial support of Mision Barrio Adentro in the health field, the deceit is now clear. As one can ascertain day to day, the very visible role of the more than 40,000 Cubans has less and less to do with the collective needs mentioned above and more and more with the instruments of State control and repression. They are notorious in identification offices, registries of public documents as well as assessors to the political commissars in any official department, not to mention their role in security as body guards in mansions and work places for the Big Boss and the high bureaucracy. Chavez publicly admitted on Sunday 4/25/2010 their presence in the armed forces, in a way that dwarfs the past USA military mission. To conclude, anarchists today must be clear that the Cuban State, in order to survive has become a parasite of the Venezuelan State, who in turn needs Cuba to maintain control over the society it governs. Let’s remember what we said at the beginning about positions essential to anarchism such as solidarity from below among the peoples who struggle against the State and against any other form of oppression. This is the reason why anarchists in Cuba and Venezuela try to foster links among the social base, because solidarity is essential to confront common challenges. º www.mlc.acultura.org.ve, web site of the Cuban Libertarian Movement (MLC) of Cuban anarchists in exile. In addition, in the text section of the El Libertario web site www.nodo50.org/ellibertario as well as in several issues in print there are available a large quantity of documents relating to Cuba and Cuban anarchism.